Good morning readers! I have to say, I had the best day off yesterday. Not only did I get to do my food shopping in my new favorite coat, but I made proper British scones and enjoyed them with clotted cream and tea. How appropriate of me, right? 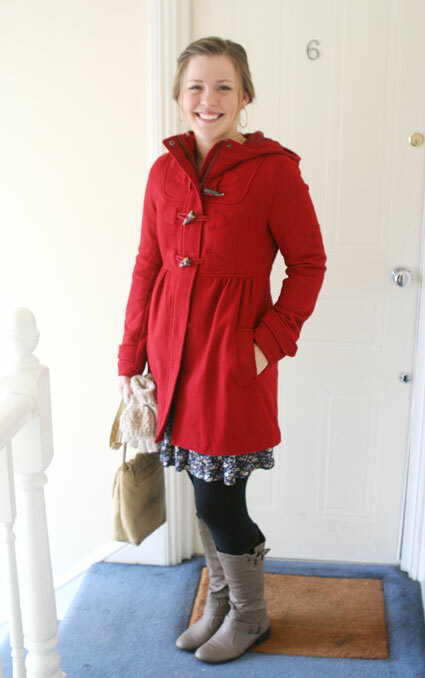 Let me first show off my little red riding hood coat, as I like to call it. I snagged this one on Boxing Day. I love the color red, warm coats with big hoods and good deals, so this was a win x3. 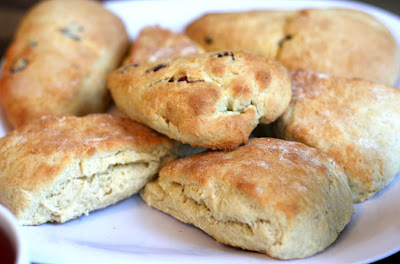 Now for the scones. These are so easy it's hard to believe they taste so good. I started making these late in the morning and they were the perfect brunch. The recipe lends approximately 10 scones and takes hardly any time to whip up. 1. Preheat oven to 400°F (200°C). Lightly grease a baking sheet. 1. Combine flour, sugar, baking powder and salt in a medium bowl. Cut butter into dry ingredients and mix it in with your fingers until only small pea sized bits are left. 2. In a small bowl beat egg and milk together. Sir wet mixture into flour mixture until fully moistened. 3. On a lightly floured surface kneed dough briefly. Choose whether to add other ingredients, like dried fruit, lemon or orange zest. I cut my dough in half and added dried cranberries and orange zest to one part. 4. Roll dough out into 1/2 inch round. Cut pie piece wedges out of the dough and place on baking sheet. 5. Bake 10 minutes or until golden brown. 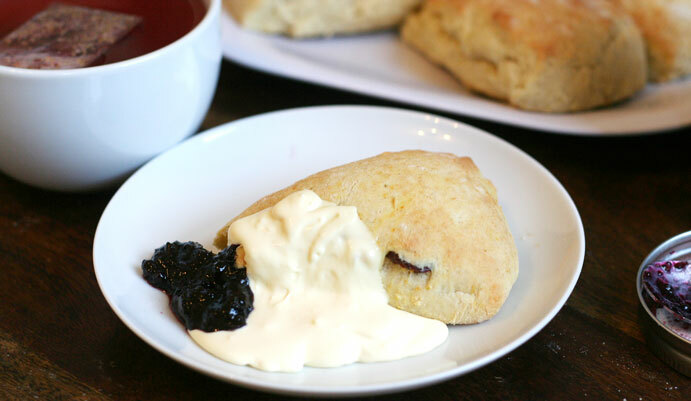 While the scones are baking, I highly recommend making some Devonshire cream. Here's a great recipe for it. I was able to get Robba's Cornish Clotted Cream at my local grocery so I stuck with that. It's really tasty. I even enjoyed mine with the homemade blueberry jam my sister sent me for Christmas. Thank you Alicia, I love it! What adventure did you have this week? Link up at Alicia's Homemaking. P.S. Love the red coat. It's supposed to be a British one, although I might need to go try one from a restaurant here and let you know if there's a difference. That totally looks yum! I think my hubby would enjoy this. He is always talking about scones and crumpets. haha! When you say that a recipe "lends" 12 scores, is that a bit of British shining through?! ;) I'm going to make these for Harbor and myself this weekend. We're going to St. Mark's to see the lighthouse! I haven't been there since the time I went with you and Linds. It'll be so happy. oh, and P.S. I also love your red coat. You're adorable. Haha! Kaitlyn that's funny. I'm not sure why I used that word. Not even sure it makes good sense. I think you guys will love them! I actually preferred them with nothing added, perfect with a little butter or jam. <3 Have fun at St. Marks, such good times. Just stopped by for the first time and love your blog. Started following you on bloglovin so I can keep up with your travels and yummy looking food!